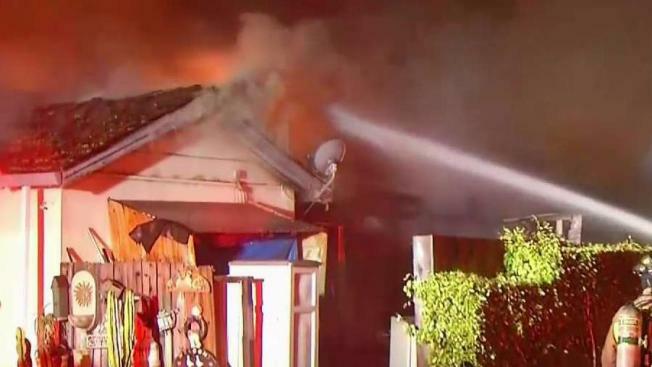 A firefighter was taken to a hospital as a precaution and two people were displaced after a house in Gilroy burst into flames early Thursday, according to fire officials. Kris Sanchez reports. A firefighter was taken to a hospital as a precaution and two people were displaced after a house in Gilroy burst into flames early Thursday, according to fire officials. The house, which is located at 401 Broadway in the South Bay, was gutted by the flames despite rain pouring down at the time of the blaze. "It was a pretty significant fire," Chris Weber with the Gilroy Fire Department said. "The whole house is a total loss." Nearby resident Forrest Coffman described hearing a loud bang before peering out of his window to see the blaze. "It sounded like two cannon shots went off," Coffman said. "It almost like shook the ground." Coffman said the house was consumed by a "complete, enormous fireball." "The flames were at least 40 to 50 feet high off the top of the roof," he said. Firefighters were forced to go on the defensive due to the amount of debris and other clutter in front of the house, according to Weber. The firefighter who was transported to the hospital is believed to have been suffering from deydration, Weber said.